No previous experience with the ukulele is required, however owning or borrowing an instrument will be necessary. T-CUP is intended to be a community outreach, service-orientated program where members will learn and arrange music to bring the the greater community. Such sites may include elder care facilities, hospice care, schools, churches, parks and special events like the David Letterman Show, if he calls. The general id﻿e﻿a﻿ of this g﻿rou﻿p is that music may be somewhat orchestrated. We will use the Yellow Book, along with some arrangements. The music may be Bach, The Temptations, Crosby Stills Nash and Young, Duke Ellington, Ray Charles, or the Beatles - anything that sounds good! 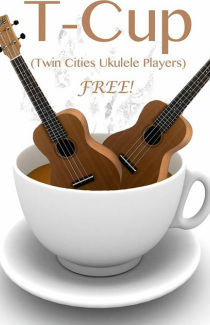 ﻿More information on T-CUP﻿, contact Emily at tcukuleleplayers@gmail.com or call 612-275-4701.